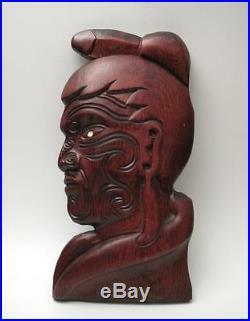 VINTAGE HAND CARVED WOODEN MAORI CHIEF WARRIOR WALL PLAQUE HANGING NEW ZEALAND. FINE VINTAGE MAORI CHIEF HANGING. Presenting a superb vintage hand carved wooden Maori wall hanging depicting a Native Maori Warrior Chief. The proud Chief is carved in profile and beautifully decorated with fine traditional Maori facial tattoos. A feather earring and headdress, along with an inlaid paua shell eye, perfectly complete the piece. This fabulous piece has been expertly hand carved from one solid piece of beautifully coloured native timber. There is a lovely depth to the flat-backed portrait, which, with a hole to the reverse, is designed to hand upon the wall. The timber carving has developed an appealing patina that only time can bring. This fabulous piece is presented in good vintage condition with no obvious damage. Upon close examination, there has however been a break to the tip of the feather upon the Chiefs headdress, which has been re glued by the previous owner. This is noticeable only on close examination. The inlaid Paua Shell eyes are perfect with no cracks or losses. This piece presents very well and the small repair would not at all be noticeable when this piece is hung upon the wall. This impressive piece measures approx 285mms tall x 145mms wide. This fabulous vintage piece has massive retro appeal, and would make a gorgeous feature in any Tiki or tribal themed home or bar not to mention a fine addition to any Maori Tiki collection! This superb piece would make a fine addition to any Maori Tiki or Oceanic Art collection! A fabulous gift idea for the admirer of more unique, fine quality artistically designed retro objects! International buyers are most welcome. Sorry, no personal cheques accepted. All items are professionally packaged using quality materials. We individually hand select quality vintage, antique, well designed and hand crafted pre-loved items, and proudly offer our finds for sale. We aim to describe and visually represent our items as accurately as possible. The item "VINTAGE HAND CARVED WOODEN MAORI CHIEF WARRIOR WALL PLAQUE HANGING NEW ZEALAND" is in sale since Sunday, September 18, 2016. This item is in the category "Antiques\Ethnographic\Pacific Islands & Oceania". The seller is "threetreefrogs" and is located in Melbourne, Victoria.